I can ski. I’m a skier! This new year I learned something new. I learned to ski! About to learn to ski for first time! 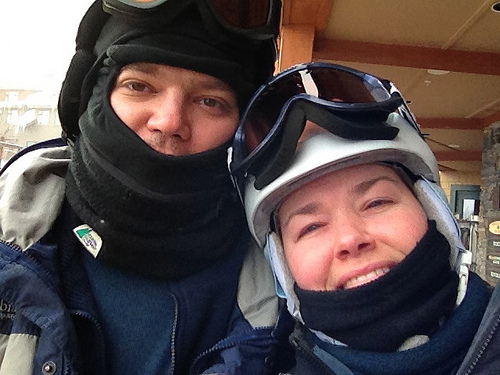 Chris is a pretty seasoned skier; he learned how in university and has been skiing ever since. He goes on a major “guys” vacation every year to places like Whistler, Utah, Lake Tahoe, etc. But this holiday a bunch of us decided to go to Vermont, and it would be a chance for me to take some lessons and give it a try. Have I mentioned that I’m 35 years old and I’ve virtually never skied? I have a vague recollection of going to Talisman in Ontario when I was maybe 12 or something, but I don’t really remember much about it. 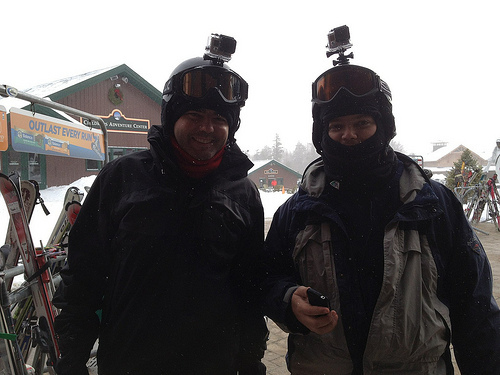 Cass & Chris outfitted with GoPro cameras, which means there’s video of me cartwheeling down the mountainside. Porter now flies a direct flight to Burlington, Vermont, and its just over an hour flight. We spent a couple days, including New Years, in Burlington before heading to our B&B in Waterbury and hitting the slopes. We spent two days at Stowe, then took a day off because it was -27°C (almost a record breaker), before heading to Mad River Glen. 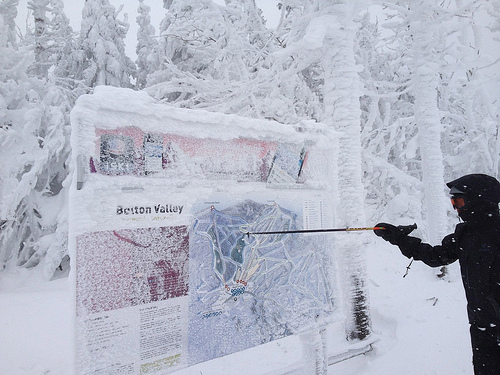 On our last day we spent the morning at Bolton Valley. I was fortunate enough to get what was supposed to be a group lesson as a private lesson at Stowe — the “learn how to put on your skis, how to ride a chairlift and how to stop” kind of lesson. That was really great and I didn’t have to feel like a dork because there was no one else in the class to compare with. The second lesson I took wasn’t as great, as I was paired up with an 8-year-old who kept falling down on every turn down the bunny hill. After a while I bailed on the lesson and decided I just needed to practice and build my confidence because I had the basics. By the afternoon of day two I was (sort of) ready to try out a long green run called the Toll Road on the big hill across the highway, and to send Chris away from babysitting me so he could do some “real” skiing before we left the resort. 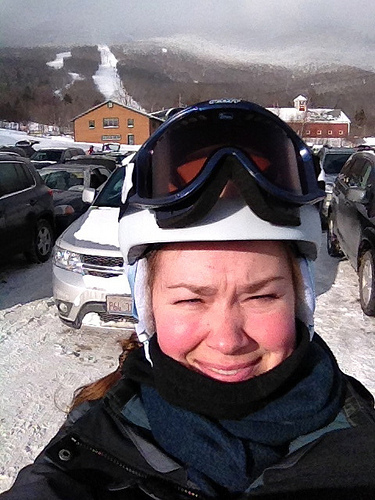 Sarah Learns to Ski from Sarah Mulholland on Vimeo. So I got on the gondola and headed over to the chairlift across the way. I ended up alone on the lift, so I had lots of time to psych myself out! By the time I got to the top I was pretty freaked out — it was unbelievably cold and windy up there, and trails went off in every direction. I had wanted to take some photos on my phone but I could barely operate my fingers long enough outside my mittens to turn on a ski tracking app on the phone (so at least I have proof that I did it!). And I did! My hands were shaking every time I stopped to check my map, and sometimes I wasn’t even sure I was on the right trail. It took me over an hour to get 5km down the mountain, but I did it! Mad River Glen is a unique resort that’s cooperatively owned, making it pretty anti-corporate and very community-oriented. It’s entirely natural snow, and their tag line is “Ski it if You Can” which maybe says a lot about it. 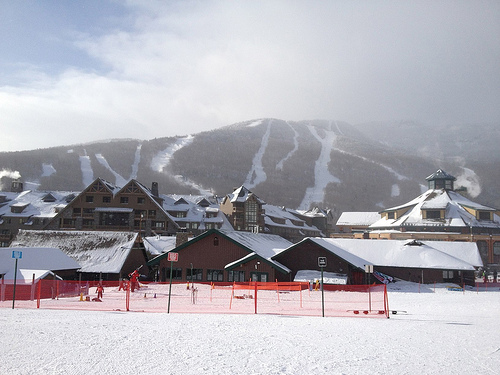 It’s generally considered one of the most challenging places to ski in the east. I certainly had issues! I had a pretty rough go of it on my first attempt, so much so that I was ready to give up afterwards. But after warming up, getting some food and letting my frustration cool off, I took it again, and did not too badly. The next day at Bolton Valley, a fairly small and easy resort, I didn’t fall at all! Of course there’s no video of that because Chris was off doing his own thing, but my ski track app says I was hitting speeds as high as 50km! Not bad for a newbie! I’m pretty damn proud of myself for trying something entirely new that was very scary. I mean, it’s not like I bounce that well anymore! I enjoyed it so much that I’d like to get my own skis and do it again soon so that I can practice some more, so Chris and I might hit a couple of the hills around Ontario later this winter, if things get cold again and we get more snow. It’s not usually Chris’s thing to ski locally as he’s kind of spoiled on real mountains, and our local runs aren’t that challenging for him, but I think he’s happy to humour me, and its something we can do together. And Vermont isn’t that far away either, thanks to Porter!